Jotting down what your kids tell you isn’t a short cut to writing. Does your child excitedly share stories and experiences but is blocked when she tries to write them down? Does his writing not reflect his sophisticated vocabulary? Does she refuse to pen more than a word or two? Does he struggle with handwriting or spelling? If you answered yes to any of these then your child may be in the Jot It Down stage. Kids in that stage are often between the ages of five and eight, but age doesn’t matter so much. What matters is where they are in the Natural Stages of Growth. Forget all the scopes and sequences. Focus on love, joy, and self-expression. Catch your child in the act of thinking or storytelling and write down what he says. Let her dictate with you acting as secretary. With your child’s permission, share some of his thoughts and stories with family and friends. This is how you slowly help your child see the value of putting thoughts into writing. So, each time something happy or interesting happens, jot it down. Pay attention to your kids—as in, pay attention to their happiness quota. Use gel pens and brightly colored paper sprayed with perfume! Continue to learn handwriting and spelling but do that through copywork not your child’s original thoughts. For more information about this stage, listen to the free Jot It Down! podcast. Also consider our Jot It Down! product. It gives you ten original writing projects you can do with your children. These are activities (one per month) that enable you to focus the original writing impulse in a specific direction (fairly tales or writing letters or issuing party invitations). They are delight-driven writing activities and cover a range of writing skills. And your child never has to lift a pencil! Or check out our Jot It Down! bundle and save. But it doesn’t give me time to think about the places I read about. It throws all this nonsense at me about how the gardens are lush with roses and papayas and whatever, and it doesn’t let me think about the place just described. The book could tell me that people living there have mushrooms growing out of their butts, but it would mash it together with some other information, so that I wouldn’t really notice, unless I dig into the book again to find that 1 fact. Let me put it this way, if your piece of gum runs out of flavor, you spit it out, right? This is a book where you shove ALL of the gum from that pack into your mouth at once, creating an enormous ball of information that you can barely analyze. Chewing this wad of gum is nearly impossible, and digging back through that ball of gum in order to find the one piece that was a different flavor is extremely time consuming, and difficult. It’s not that I don’t want to do these logs, because I would do them for most other books. But trying to do this for “Around the World in 80 Days”, is a time dump, that is unnecessarily hard. Sorry if this sounds like another one of my famous rants to you, but it’s just my opinion on the matter. The book is confusing me with a pestilence of information, that I can’t really swat in order to put into my brain. It’s just all buzzing around my head annoying me. For the first time, I got a glimpse of the writer he could one day be, of the one he is becoming, as his mind starts to work in abstractions. Just for that gum metaphor alone, I told him, just read the book, forget the log! I wanted to share because I think these subtle changes are coming from his experiences with free writing and your classes. I can’t wait to see what he can accomplish this year! Cindy, what a delightful sample of the emerging rhetorical thinker your son is becoming! The early to mid-teens are when the brain takes a big leap forward in cognitive power. By 25, the prefrontal cortex will have completed its development, but in the interim, the brain is slowly developing new wiring. The complexity of that neurological growth leads to a variety of brand new thinking skills! One of those is the capacity for imagining multiple perspectives simultaneously, as well as the enhanced ability to articulate one’s own posture (while challenging someone else’s). Remember when your child was younger and he would simply assume if assigned a lesson, the lesson must be completed. When a child read a book, the author was considered to be an authority, an expert. Children may have personal preferences that they articulate prior to the teen years, but they are not as likely to question the fundamental authority with which adults express their opinions. They may not like what the authority intends, but they don’t question its right to assert power. By the teen years, then, emerging adults begin to question the source of authority of any given speaker or writer. They wonder on what basis that point of view is valid. They recognize that even their much loved parents are not always operating from dispassionate clarity, but from personal bias or inadequate experience. Andrew is challenging two authorities in this scenario. First, he is questioning the lesson (lesson-maker). He is not just saying, “I don’t want to do this assignment” like a child might. He’s analyzing the reasonableness of the assignment. He is using his own analysis of the contents of the book to bolster his reaction to the way the lesson-maker wrote the assignment. He even goes further to say that he’d happily complete logs for any number of books (proving that it is not childish will or lethargy that drives him), but this one novel, this specific book is not conducive to that assignment as constructed. Second, Andrew is challenging you—your authority to require him to do an assignment he finds unreasonable. He is asking you to hear the reasonableness of his argument and to overturn your good judgment by honoring his! What’s wonderful is that you see all this amazing mind-growth, and are in awe of him, rather than put off by his unwillingness to complete the logs. So when your teen tells you that it’s reasonable to stay up all night for the third night running playing video games, listen to the construction of the argument. Listen to the way he appeals to you. Is he providing reasons? Is he considering the possible reasons you might say ‘no’? Is he exploring the possible repercussions to his own health to reassure you? Is he finding his own sources of authority to back his argument (even if those sources at first glance seem unduly biased or insufficient from your point of view)? If he’s doing these things, you can be thrilled for his brain development no matter how much you worry about his getting too little sleep. Start with the brain. Start with enthusiasm for this new burst of argumentative challenge—where what you say doesn’t automatically go. This is how you grow critical thinkers. Your kids’ thoughts may be revised 100 times in the next 5-10 years. But it’s the fact of that revising process that you want to celebrate and foster. And notice! Well done Cindy! You’ve given us a great example of the teen brain in full flower! Before kids can write their thoughts and ideas, someone else needs to do it for them. Focuses on the most overlooked stage of development in the writing journey and accounts for the development of writer’s block and writing resistance in kids. If you successfully navigate the Partnership Writing phase, your kids will not be plagued with the “blank page, blank stare” syndrome. You’ll both know how to create writing and what role you each play in the process. The stop and start stage of writing. One day the student gets a detailed story to paper. The next week, she complains that she hates writing. In this podcast we look at how you can create the conditions for growth and joy in writing with your kids. This is our first of a two part discussion of the Transition to Ownership stage of writing growth. This is the time when your students are making the somewhat treacherous journey from adorable, fact-centered child to rhetorical imagination (the awareness that the world is inhabited by unlimited numbers of perspectives). Continues the discussion of your role in the “Big Juicy Conversations” you need to be having with your fledgling thinkers. This podcast features discussion about the high school writing life, on into college. Don’t miss it! It will help to shape your philosophy of writing, not just your program for writing. Learn more about Brave Writer and the Natural Stages. Developmentally appropriate writing projects for your middlers. A weekly and monthly plan that puts it all together. 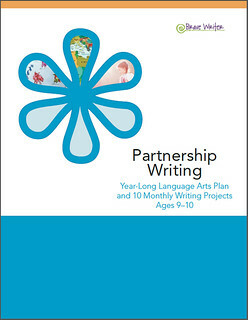 Partnership Writing is the second in our series of products that gives you developmentally appropriate writing projects for your kids in the partnership writing stage of development. Jot It Down! is the first. 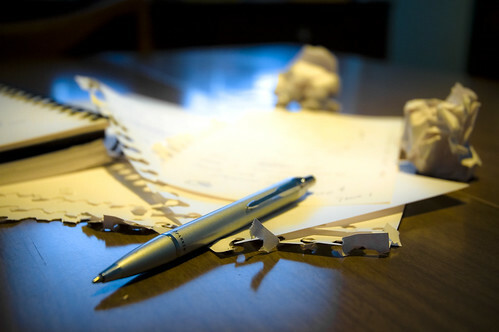 Have you wondered why your writing assignments stall? Do you wonder why your kids give you a blank stare after you ask them to fill a blank page? Do you have a tough time creating writing assignments that are both creative (interesting) and academically sound (preparatory for essay writing)? And just how do you put together a program that includes copywork and dictation, as well as the language rich environment you hope to foster in your home, while still teaching original writing? Partnership Writing tackles it all! It can work alone (as a tool you use to boost the power of your writing efforts with your kids) and it can work in tandem with other Brave Writer products: The Writer’s Jungle (the manual that teaches YOU how to teach writing), and The Arrow (the tool that provides you with great literature to read, grammar, spelling and punctuation help, and copywork/dictation passages). Plus we have special bundles on the website for Partnership Writing + The Writer’s Jungle and/or The Arrow. To learn more about the Partnership Writing stage of development (usually 9-10 year olds, but also good for younger advanced writers and older kids who struggle), you can check out our Getting Started with Brave Writer page. You can also listen to a podcast by me where I explain what Partnership Writing is. This is the perfect product for you if you need help thinking of writing projects and want to know how to plan them for a month at a time. not just how to write. Posted in BW products, Natural Stages of Growth in Writing, Young Writers | Comments Off on Partnership Writing is here! The Natural Stages of Growth in Writing: Holiday Edition! This is a great season to capitalize on natural writing opportunities (rather than relying on contrived assignments). I’ve included some of the most obvious ideas along with ones you may not have thought of! I’ve also organized them to fit with the Natural Stages of Growth in writing (taken from Chapter 14 of The Writer’s Jungle). You can listen to podcasts about each stage too!